Mary Jo Gilmer with therapy dog Annabelle. Gilmer’s research on the effectiveness of animal-assisted interactions with children with cancer was a top story on CNN. Photo by Susan Urmy. 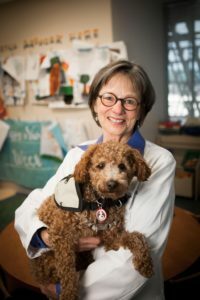 A CNN video featuring Vanderbilt University School of Nursing Professor Mary Jo Gilmer, PhD, FAAN, and her research on the effectiveness of animal-assisted interactions for children with cancer has had worldwide reach. The story showcased Swoosh, a therapy dog at Monroe Carell Jr. Children’s Hospital at Vanderbilt, and two boys he helped through cancer treatments. When CNN posted the video to its Facebook page, it initially received 242,000 views. Subsequent reposts led to the video being seen more than 1.52 million times on Facebook alone. It was also featured on CNN’s international Facebook page and its Twitter feed. Gilmer was Vanderbilt’s principal investigator on a multisite study that found animal-assisted interventions may be beneficial for parents and families during pediatric cancer treatment. “Measuring the Effects of an Animal-Assisted Intervention for Pediatric Oncology Patients and Their Parents: A Multisite Randomized Controlled Trial,” co-authored by Gilmer, was published in the Journal of Pediatric Oncology Nursing. The Monroe Carell Jr. Children’s Hospital at Vanderbilt was one of five pediatric hospitals in the study. Vanderbilt co-investigators include Terrah Foster Akard, PhD’08, MSN’01, FAAN, associate professor of Nursing, and Debra Friedman, MD, E. Bronson Ingram Professor of Pediatric Oncology, and director of Hematology/Oncology at Children’s Hospital. The study was sponsored by American Humane, with funding from the nonprofit Human-Animal Bond Research Institute and Zoetis, a global animal health company. This entry was posted on Thursday, October 4th, 2018 at 2:53 pm	and is filed under Departments, Fall 2018, Issue, News Around the School, Vanderbilt Nurse News. You can follow any responses to this entry through the RSS 2.0 feed. Both comments and pings are currently closed.